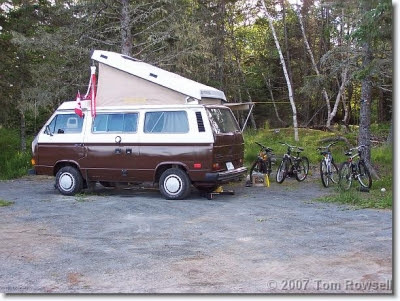 Well, we have not camped in the "Westy" in a couple of summers, and going back to it from a motorhome was a little challenging. I think we enjoyed the "coziness" nonetheless, not to mention better gas mileage and maneuverability. It also allows more simplicity, since you just can't take all the same junk with you. Again this year, we went to Rissers Beach Provincial Park, only this time we stayed in a site right on/near the beach.